One of the things you might notice about the new generation of consoles is the universal adaptation of second-screen gameplay options. 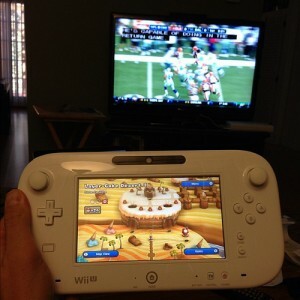 The most drastic is Nintendo’s Wii U controller, with the screen built right into the controller, though there are also Sony’s Remote Play and PlayStation App solutions and Microsoft’s SmartGlass implementation that all allow the player to add outside devices to their console gaming experience. These intrigued me on two fronts: the first, which was relatively easy to answer, was where this all came from. The second, which was virtually impossible to answer, was: are these transmedia experiences? To find out, I needed to make sure that I understood just exactly what everything was, what it could do, and what was going on. Xbox Smartglass implements revolutions like looking at your pseudo-Tamagotchi self-manufactured manifestion of your inner self-image. Thanks to Flikr user urbanbohemian for letting me share (but not edit) this totally original content that you’ve created. Since Sony has two options, it’s important to recognize the difference between the two before looking at them critically: Remote Play specifically refers to using a PlayStation console with a PlayStation handheld, which allows for a game to be played using the Vita or PSP as both the screen and the controller, freeing up the television for use by others. The App, on the other hand, acts as a second screen offering fundamentally different, yet complementary, processes to what is happening on the PS4. For example, it could be used as a rear view mirror in a racing game, or as a minimap in an adventure. It also allows for the player to access their friends list, stats, and profile, as well as allowing the player to use it to control other system apps like video playback, all while being available on iOS and Android devices. 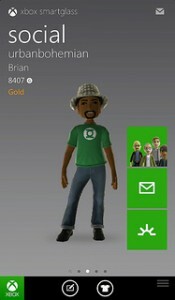 Xbox SmartGlass, which is Microsoft’s solution, is little different than the PlayStation App. It can be used on modern iOS, Android and Windows Phone smartphones and offers similar integration with the Xbox to be used as a remote control, to launch apps, make searches, get information about currently playing videos, and, yes, extend gameplay to a small screen. It also allows the user to view their friends, Avatar, games, and, most importantly, the stores! Nintendo put the biggest bet on a second screen by far by building it right into the controller for the console. The controller is shaped like a large tablet with typical controller buttons built into the sides, and includes typical tablet features like a built-in speaker, a front-facing camera, and accelerometers, as well as rumble. In single-player games, its screen is generally used for things like inventory management, maps, and occasionally a more unique gameplay feature, but it also allows for any Wii U game to be played entirely on the controller without any TV use at all, much as Sony’s Remote Play does. While the sudden rise of 2-screen console gaming might be a little surprising, the choice to include them is certainly not. There are two predominant reasons for this, the first being an evolution of the historical connection between consoles and handhelds, and the second being an attempt to tap into the market of smartphones and tablets. Sony’s Remote Play feature actually dates back to 2006, when (at launch), PS3 users could play PS1 games on a PSP, as well as a very select number of PS3 games. Nintendo has supported two-screen gameplay since the Gamecube, when they sold cables that could connect Game Boy Advances with the console, though it was only rarely used for active gameplay. They also introduced the Nintendo DS in 2004, which had a built-in second screen that was used in single-player games in many similar ways to the current Wii U. The Wii U could be seen as an introduction of the DS’s gameplay style to a console setting, though it could also be motivated by touch screen mobile devices like the Xbox and PlayStation were. The console establishment has been worried about mobile games since the introduction of the iPhone in 2007, and they have taken moves to mitigate the migration of not only players but developers, courting indie developers and making it easy to publish on their systems (some indie studios would say only in Sony’s case). Mobile games currently make more money than the handheld console industry, and there have been fears that mobile games would steal dollars from console games. These fears haven’t come to pass, yet console makers still seem interested in adapting the mobile experience into their own. This is the first generation to start since the debut of the iPhone, and consoles are, for the first time, designed from the ground up to interface with smartphones and tablets, allowing them to use mobile devices in more versatile ways. Finally, you can play your favorite Nintendo games while your friends come over to watch “the game” without enduring slurs towards an implied sexuality! F U T U R E. Thanks to Flikr user daveynin for standing up for gamers everywhere by posting this image. There is also the implication that these new consoles are all meant to get out of the bedroom or playroom and into the shared living space, which I don’t really understand. Wii U and PS4 both allow one to play games while somebody else uses the tv, while the Xbox One is all about quickly switching from games to television or video without losing your progress. I assume that it is because once a console is in front of the entire family, more people will be putting money into various online shops, but honestly it doesn’t matter that much to our current discussion. However, one pedantic and functionally irrelevant consideration that does matter to our current discussion (and people such as myself may want answered) is: are these transmedia experiences? Does the interface of the Wii U controller count as a different kind of media than the Wii U itself? The console can be used with Wiimotes and its Pro controller without the GamePad, though obviously the entire console is designed around it. While the definition of transmedia is relatively set, this issue is more about the definition of media itself; Mirriam-Webster defines media as the plural of medium, where the relevant definition is “one of the means or channels of general communication, information, or entertainment in society, as newspapers, radio, or television.” This is incredibly unhelpful. Is what composes a medium the fundamental nature of a device, meaning that all computers are one medium? In that case virtually any game with an internet ARG isn’t a transmedia experience, which I personally would disagree with. Could it mean that different protocols = different media? This makes a little bit more sense, but would that make combination devices like an LG television with built-in Google TV functionality a transmedia device, which also doesn’t entirely strike me as too outside the realm of possibility. Perhaps it involves different programs sharing merely content, but would that make the Remote Play a questionable service, as the transmission of the PS4’s display to the Vita is done using the Vita’s own hardware in conjunction with the Gaikai streaming service. Many of the Wii U’s games, especially in multiplayer, provide fundamentally different experiences between the player with the GamePad and the players with Pro or Wii controllers; does it matter that these two are on the same disc, running the same code and often cannot be done without the other? It’s interesting that in very few of these cases, the second screens are designed on a console level to integrate with the games being played on the console; these do not include the functionality to allow for one to play a totally different game. Obviously the Vita, smartphones, and tablets can all play their own games, where more traditional version of transmedia universes exist (such as with Grand Theft Auto V’s dedicated iFruit app), but the Wii U GamePad, PlayStation App, SmartGlass, and Remote Play are essentially useless in a gameplay sense. They cannot play their own games, only modify the experience of games that are being run on the consoles. Perhaps that is the defining characteristic? That they are literally, functionally useless without being connected to something else? All in all, this is a difficult question that is unlikely to have an easily identifiable answer. It also really might not matter – what is changed by applying the label of transmedia to these services? I’m beginning to think that its relation to transmedia largely comes from the association with media: is SmartGlass a phone app or an Xbox program? Can different forms of media exist in one device? It’s all very confusing, but perhaps necessary. We need to consider the question “what does transmedia really mean?” Can it only be applied to storytelling? Can it be applied to simple technologies? Is that different than, say, a cross-media platform? What is transmedia really about?